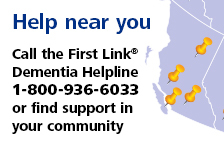 Coffee Break® | Alzheimer Society of B.C. Bring your friends, family, co-workers and customers together this September and October by hosting a Coffee Break® fundraiser for the Alzheimer Society of B.C. It’s as simple as offering a cup of coffee, tea or other treat in exchange for a donation. We make it easy by sending you a complimentary kit (including the coffee!) with everything you need to get started! When you host a Coffee Break® in your community, you help raise much needed funds to support local programs and services for people affected by dementia, as well as enabling research into the causes of and cure for dementia. You’ll also be helping us raise awareness of dementia, which will help us build a dementia-friendly society: a place where people affected by dementia are acknowledged, included and supported. Registrations will open Summer 2019, so stay tuned! The great thing about Coffee Break is that it can be exactly what you want it to be! Your event can be big or small, public or private. First step is to decide on where you’d like to hold your Coffee Break. You can hold your event anywhere you have permission to: offices, schools, retirement homes, your workplace, community centres, or in your living room – wherever your group can gather, coffee can be served and donations can be collected. Remember that you don’t need to be limited to coffee! You can also think about offering tea, juice or milkshakes. Love to bake? Add treats to help increase your fundraising! How can my retail business take part? Ask us for a Forget Me Not Flower kit! This complimentary kit includes Forget Me Not flower cardboard cut-outs that will help your business raise funds and awareness. Just add the flower’s UPC code to your inventory, and invite your customers to exchange a flower for a donation. Your customers can personalize their flower, and you may choose to display them in your store, which will raise even more awareness! After the month is over, tally up your total and send the donations in. Thank you to our sponsors Melitta Coffee and Global BC for their generous support of Coffee Break®.